﻿And....it's Friday. Time flies when you've committed to write about something every day. But it's a whole lot more fun than time dragging on. 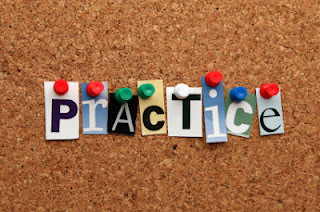 When it comes to the practice of writing, the great thing is that it all counts. If you want to be a writer, then write. The more you do it, the better you become. You can handwrite in a journal, dot every i and cross every t in an important email, or work on the next best seller on a Word document on your laptop in front of the fire. It's all good. It's just important that you and I write - over and over and over again. Today's challenge was to take your writing one step further than you currently have been doing. Jeff calls it practicing in public. This step will look different for different writers, depending on where you are with your craft. For some, it may be sitting down for the first time and writing what you're thinking in your head you'd like to write. If you're already comfortable with blogging, you might want to see if you can guest post on blogs and challenge yourself to write to other writer's guidelines and submission policies. Then again, if you have some killer stuff already written, you might want to see if you can start submitting those items to a magazine, a publishing house, or an editor. The goal here is to stretch yourself - and your faith in yourself - and push a little higher and futher than you usually do. Don't let fear hold you back- the only way to start is to just start. And then leave a comment below and let me know where your leap of faith took you- I can't wait to hear. We're better together and we can encourage each other! I am taking the same challenge... great ideas let's encourage each other to write. I'm so glad you're taking the challenge too! It's fun. And..we get a break for the weekend. But don't forget to keep writing! I'm intrigued by this challenge that you've taken on! I, too have been sensing God's promptings to write. I've done some, but I don't think that I've really thought about it as a craft to be honed, but rather a message to deliver. I have, however, picked up a book called "Getting the Words Right" (or something close to that title). It's about editing your own writing... Very helpful and practical. Do you see yourself as a fish? Then swim! Are you a bird? Fly! A writer? Well, do what writers do. I'm not sure I'm there yet... maybe more of a "communicator" or an "instructor"... and perhaps writing is one of the tools in my box. And that begs the question: "Am I doing what a communicator/instructor does?" Some of this challenge is rubbing off on me... thanks for sharing it with us! You are so welcome! I'd like to get a copy of the book you mention above- sounds very interesting. For writing, a great site to check out is www.faithwriters.com - I've gotten some cool opportunities through there. It's a huge resource and community of Christian writers. I like how you make the distinction between writing and communicating/instructing (teaching?) and see writing as one of perhaps many tools you can use. I think you're *write* on target with that idea.